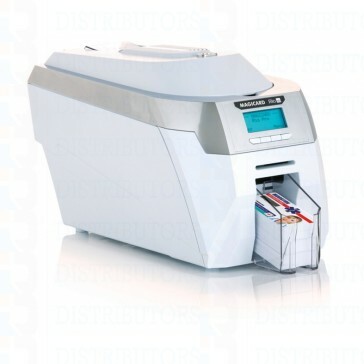 Magicard RioPro 3652-0004 single-sided card printer with built-in magnetic & smart card encoding was built for professionals, the Rio Pro’s superior card printing quality is complemented with a full range of options: single or double-sided printing with field upgrade available, batch or one-off card printing and secure encoding with magnetic stripe, contact and contactless technologies. Built-in Standard HoloKote® can also be customised to an individual logo or security design. include magnetic stripe and smart card technologies. display provides intelligentuser information and interaction. single-sided Rio Pro to duplex printing using a simple in-field upgrade kit. hassle-free printhead cover and loaner service. Visual security The user has the option to print a HoloKote® security watermark across the card surface. When used with HoloPatch® cards, one area of the HoloKote watermark is highlighted as a high visibility security seal. A choice of 4 fixed HoloKote patterns are selectable from the printer driver. For added security, Custom HoloKote enables customization of the watermark to an individual logo or security design. Print speed Color fast mode: 23 seconds, Monochrome resin: 6 seconds (*single-sided card).